County Sligo – or Rosses Point, as it is better known – is an exhilarating west coast links, situated in the heart of Yeats country. W.B.Yeats won the Nobel Prize for Literature in 1923. County Sligo Golf Club started out with a nine-hole course, designed by George Combe (contriver in 1896 of the world's first handicap system), and opened for play in 1894. At the turn of the 20th century, Willie Campbell extended the course to 18 holes. The famous Colt and Alison partnership remodelled the course in 1927. There are many spectacular golf courses in Ireland and County Sligo is no exception. The views of the Darty Mountains and Benbulben, Sligo’s limestone “Table Mountain”, are simply beautiful. Drumcliffe Bay sweeps around the golf course. Its fine long sandy beaches, the Atlantic and the harbour are often in full panoramic view. The Ox Mountains – Knockalong the highest peak – add a further dimension to the already stunning vista. In the same vein as the scenery, County Sligo is a real joy. It’s a strategic links with dramatic undulations, raised plateau greens, run-offs, high ground, low ground, and cliffs, challenging bunkering, burns and dunes. County Sligo has it all, including unusual routing over three distinctly different sections. The back nine, especially the 11th to the 17th, played on the headland, are truly magnificent. The sheer individuality of holes and the varied terrain makes County Sligo an absolute must-play golf course. County Sligo is the home of the West of Ireland Amateur Championship and host to other important amateur events. It was here, in 1981, that Declan Branigan won the Irish Amateur Close Championship, becoming the first Irishman to win three major Irish amateur titles in the same year. Earlier that year, Branigan won the West (also at County Sligo) and the East (at County Louth). a new tee and green extension at hole 1, a new green extension at hole 2, a new green with attendant bunkers at hole 3, a new championship tee, fairway bunker and extended green with bunkers at hole 5, new fairway bunkers at hole 6, a new fairway bunker and green extension at hole 7, a new championship tee, fairway and greenside bunkering at hole 8, a new championship tee and green extension with bunker at hole 10, a new championship tee and fairway bunker at hole 11, new fairway and greenside bunkering at hole 12 and a new green extension with two bunkers at hole 18. Rosses Point is now much more ready to face the modern championship golfer while having no adverse effect on the regular club golfer. County Sligo is a terrific golf course in a beautiful raised location that slightly defies classification. It starts with gentle then severe elevation change followed by sweeping downhill like Gullane 1/2, gully redan par 3, heroic elevated tee shot like Cruden Bay... And so it goes. Add in elements of Royal Porthcawl for the topography, Castle Stuart in fairness and sight lines, Royal Dornoch for the mid back 9 stretch, a finishing duo with blind shots like the Machrie and you have a must play course. The greens were the best we've seen so far in North West Ireland with fun contours but no buried elephants but tough in the wind, the low lying holes always had interest with properly defined burns, shaved surrounds allowing the running game, the ever present beautiful scenery, changeable weather and the bonkers but fun 17th and it's a course it would be hard to improve. Would love to come back. Judging from the reviews below, County Sligo divides opinion. Almost everyone agrees that it's a good course, but some feel it falls short of the best. I agree with the latter sentiment, I was slightly underwhelmed. There's no doubt that it's a good golf course with some very good holes and few weak ones. But having played it in a trip that took in Carne, Enniscrone and Connemara, I came away feeling that Sligo was the least strong of the four. The weather drove my off Connemara, so I'm unable to make a complete comparison there, but for Sligo to be rated above Carne and Enniscrone? I can't see that. The views are stupendous, of course, and the facilities excellent, but for me it added up to a great place to play golf, not quite a great golf course. For our round at Co Sligo the day started off kind weather-wise, overcast yet with barely any breeze. These somewhat unexpectedly benign conditions lasted for the duration of the front nine, until the clouds let loose and persistent heavy rain dominated the bank nine, albeit, oddly, without the wind ever really picking up beyond a slight breeze. The first four holes and 5th tee are positioned on and around what more resembles a mountain than a large sand-dune. After the relatively benign par four 1st played to an elevated green, the imposing 2nd hole appears a driveable par four on the scorecard but such is the sharp incline it would take an exceptional drive to find the green protected by three nasty sand traps. One of my favourites was the par five 3rd, the tee-shot a dramatic one back down the mountain to a fairway that has three bunkers on either flank and runs out at a rough covered decline before continuing on a flatter note towards the green, the only drawback (in my view) being the road crossing the fairway before the green. The 4th is the first of a fine set of par threes, the green perched high up on a plateau with anything short or right severely punished. The index 18 5th hole boasts my favourite tee shot on the course, a huge downhill drive to a generous fairway on the flat middle section of the course on what is a very reachable par five with a 45-yard long green, a birdie chance albeit there are eleven bunkers littered along the way to punish any mishaps. The flat-lands portion of the front nine (5th fairway/green and successive par fours from the 6th-8th) features the sneakily dangerous draw-favouring 6th with a hazard along the right and the very tough 7th, which is complicated by menacing fairway bunkering a treacherous burn running in front and to the right of the green, the hole framed by the dramatic backdrop of the famous Belbulben table top mountain. The approach to the dogleg right 8th was another one of my favourite shots on the course, played over the burn to what is an amphitheatre like setting at the green and a little backstop helping out any slightly over-clubbed shots. The 9th is a lovely par three across the top of the dunes with four bunkers protecting the front half of the green and an absolute no-go fall-off zone on the right side. The back nine begins with the picturesque par four 10th, again in the direction of Belbulben, featuring particularly lumpy fairway undulations and another huge green. The 11th and 12th run directly back west towards the ocean, the 11th an awkward par four (probably my least favourite hole on the course) with a fairway sloping from left to right and a green guarded by hungry bunkers, one short on the left to catch any bounce-in shots and one short on the right to gobble up any underhit shots veering to the right down the hill. The par five 12th is a decent birdie opportunity before the homeward stretch, played up and over an incline and down the other side of the hill invitingly towards the green and the ocean horizon beyond. The par three 13th tee is one of the standout scenes on the course, set above and overlooking the beach and the green below, its defences including a burn back right and ‘Lady Captain’s Bunker’ (€1 entrance fee) among the five sand traps. Whilst the final five holes are all played in a southerly direction back towards the clubhouse (13-16 alongside the beach), they offer great variety, starting with Tom Watson’s favourite, the demanding par four 14th that requires a long and accurate tee shot short of the burn that weaves its way across the fairway and an approach to an open, yet sideways sloping putting surface. I could see why Tom likes it, but I myself preferred the par four 15th, framed majestically by dunes on both sides from tee to green and overlooked by the spectacular highland section of the front nine to the left background. The par three 16th is similar to the other short holes in that the tee is above the green level, though slightly less so here, and like the others offers plenty of reward for good tee shots once you find the relatively flat green. The 17th hole, whilst one of the more memorable holes on the course, may not necessarily be the most enjoyable for some simply because of its difficulty. The landing area from the tee is quite flat and favours the right side to open up the approach to the green, which is a long way up the steep hill and surrounded by dramatic high dunes – bogey here is a not a bad score at all. The 18th is a blind tee shot over the apex of a hill and appears tricky off the tee, but the landing area is forgiving and offers a chance to get close with a short iron for a finishing birdie, although missing the green does leave a difficult up and down. Tremendous golf course with many standout holes including 5, 6, 7, 8, 12, 14 and 15. This area boasts Enniscrone (a top 20 course in my opinion) and Strandhill so well worth a trip. In summary, a beautiful and challenging course. A true seaside links; wide open, set amongst dunes and with thick fescue grasses as the predominant rough. Plenty of sand and a couple of water hazards too, as well as natural elevation changes to intensify the challenge. Some high vantage points offer excellent views along the coastline and the course. The feel of the course closely resembles the best of British and Irish links, but it's probably just not in that top echelon of courses.After being blown about in the seaside 'breeze' for 18 holes the clubhouse was the perfect place for a cup of tea and a discussion about all the shots left out there. Delightful course and delightful club. The Championship Course is being revitalised and updated in the "Colt" tradition by Ireland's leading architect Pat Ruddy with significant changes to the majority of holes already implemented. The famous Colt challenge is back with a vengance! Rosses Point. A joy after Lough Erne. I played it on a windy day, almost unplayable. A real, raw authentic golf course, very tough in the wind, no frills, a proper players course, the 17th in my view one of the best and toughest par 4s in the GBI. Some great holes, currently undergoing some refurbishment which should improve it further. I agree with this reviewer. 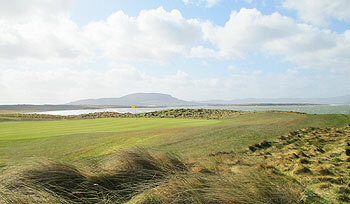 rosses point is a classic links, raw, traditional and exposed to the wind. when I was there it was blowing about 40 mph. many fine holes, the 17 is truly epic, [i was a whisker away from a heroic 4], but its a proper no fuss golf course. a nice welcome too! Almost seven years after my last visit here, I returned the other day in search of an elusive “X-factor,” something that I felt was missing first time around. The course was obviously configured as before: the first three holes are still routed up and down a hill in an old-fashioned arrangement that I find quite charming, the four par threes at 4, 9, 13 & 16 remain terrifically strong short holes (yielding not a single par on a very blustery day) and the pair of closing par fours – especially the stroke index two 17th – are as tough and intimidating as they ever were. No, what I missed when I was here in 2007 was something only ever found at a select few courses – a golfing soul! The large number of GUI pennants displayed in the entrance hall of the clubhouse gives notice to the golfing achievements of County Sligo members at regional and national level over many years and you don’t win all those tournaments unless you’ve honed your golfing skills to a very high level on a fine old track like that at Rosses Point. The place is steeped in tradition, with its West of Ireland Amateur competition identifying most of the great Irish champions – right up to Rory McIlroy in recent years – since it was first played for in 1923. The venerable old course and the refurbished clubhouse fit hand in glove and each should be savoured to gain a full appreciation of one of Ireland’s top sporting institutions. If David O’Donovan, the genial Director of Golf at County Sligo, is around when you visit then ask him nicely if he’ll give you a peek into the committee room downstairs, where the walls are adorned with old photos and correspondence associated with Cecil Ewing, one of the finest amateur golfers to ever swing a club. It’s a fitting display in honour of an Irish golfing great and well worth a wee browse around if you get the chance. Sadly I think Rosses Point is too highly rated. For me, many holes have no definition. Enniscrone was preferred, as was Murvagh. I completely agree with Mr Ruddy. Rosses Point has an awkward start but is very strong from the 3rd onwards. Should be a minimum of four balls and perhaps even five. I'm a fan of Sligo. 2 balls is ridiculous. This is one of the great Irish links.